This is the document submitted for designation under the Ontario Heritage Act by Edgar Tumak in January 2008 to the Town of Gananoque. 95 King Street West constructed in 1905, is proposed for designation under the Ontario Heritage Act for historical, architectural and contextual criteria. Constructed as a suburban mansion for the prominent Gananoque manufacturer and provincial politician, Frederick J. Skinner, the building illustrates the domestic architecture of a wealthy industrialist at a high point in the industrial mechanization and growth of the municipality. It also reflected a consolidation of the social position of a new industrial and manufacturing elite in Gananoque, vis-à-vis the influence of the traditional landed elite that dominated Gananoque for much of the 19th century. 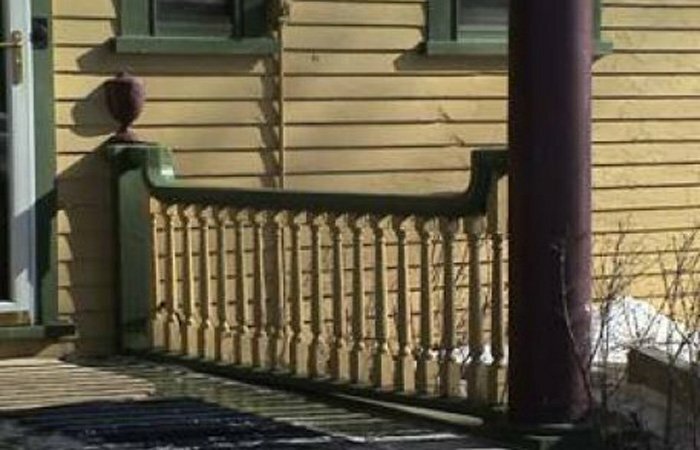 Designed by architect Frank T. Lent and constructed by the Gananoque firm Mitchell and Wilson, the building is a leading example of the Queen Anne Revival Style in Gananoque, and a notable example of the architect’s oeuvre. The building is in an excellent state of preservation and there have been very few alterations to the original design, exterior materials (wood cladding, decorative pressed metals), windows, or interiors of the principal rooms (entrance hall and stair, double parlor and dining room). The prominence of the building with its corner-lot location on King Street West is a traditional feature, and the building is in keeping with the scale and elaboration of other early mansions along this section of the street. The designation covers the all of the exterior—including all windows (save for the exterior aluminum storms), and part of the interior, namely the entrance hall and stair, double parlor and dining room. 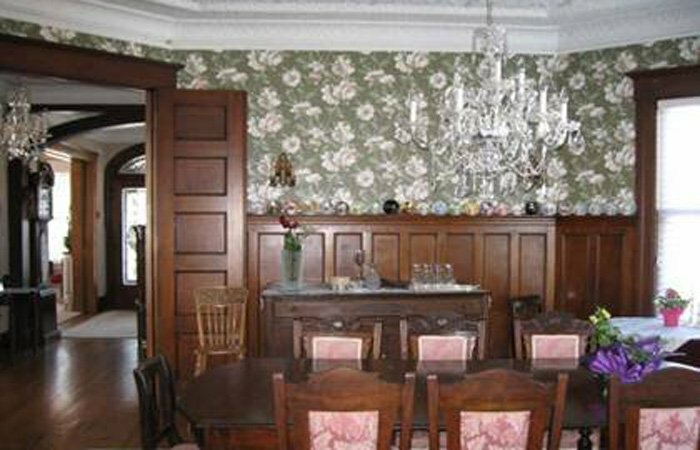 All original finishes are included in the selected area of the interior: wood floors, woodwork (paneling, doors, window and door surrounds, built-in furniture, stair), plasterwork, tin ceilings, fireplace mantels, and door and window hardware. Constructed in 1905, as a three-storey mansion for the prominent Gananoque manufacturer and provincial politician, Frederick J. Skinner, the Queen Anne Revival Style building was designed by the architect Frank T. Lent, and constructed by the firm Mitchell and Wilson. 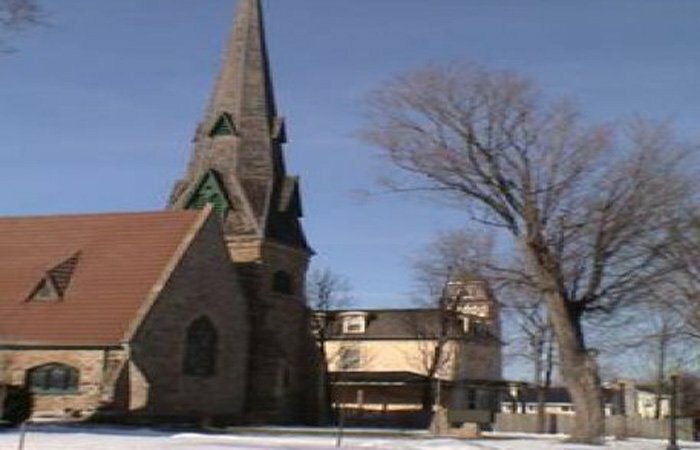 Lent worked as an architect in the United States, principally in Massachusetts and New York State before establishing a practice in Gananoque and Thousand Island area with a focus on suburban and summer residences. The firm of Mitchell and Wilson was a major lumber and building operation in Gananoque prior to and following the construction of 95 King St. W., and was responsible for many prominent structures in the area. 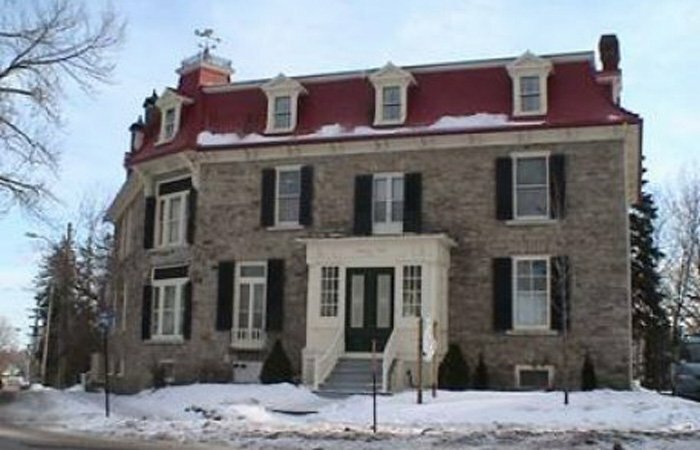 Over time 95 King St. W. has been used as tourist accommodation, a nursing home, apartments, and after 1999 as a bed and breakfast, (acquired by Don and Marion Matthews in 2001 and operated as Sleepy Hollow Bed and Breakfast since 2002). 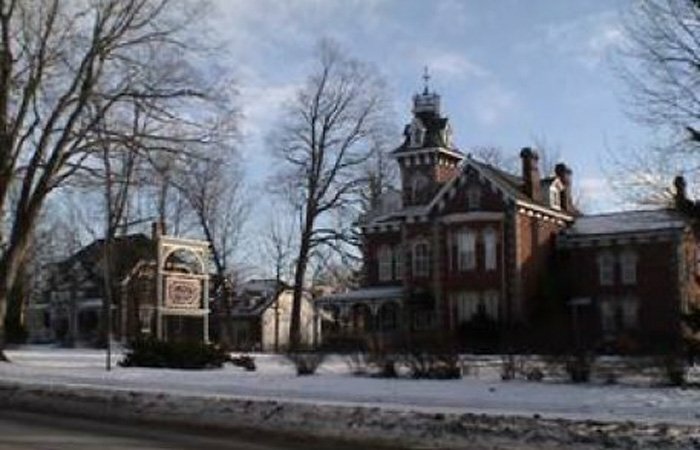 Constructed as a suburban mansion for the prominent Gananoque manufacturer and provincial politician, Frederick J. Skinner, the building illustrates the domestic architecture of a wealthy industrialist at a highpoint in the industrial mechanisation and growth of the municipality. It also reflected a consolidation of the social position of more recent elite families in Gananoque. Constructed in 1905, the house at 95 King St. W. reflects the domestic accommodation of Gananoque’s industrial elite at a time when, in addition to great growth there was notable improvements in the mechanisation and capitalisation of industrial activity. Additionally the mansion reflects the improvement of the social position of the Skinner family—along with several other families who came after the mid-19th century, and whose affluence eroded the influence of the traditional leading families. For the first three quarters of the 19th century the Stone and McDonald families (and their inter-married offshoots) dominated Gananoque: the Stones being Loyalists and the first non-native settlers, the McDonald’s entering the line early in the 19th century through marriage. Built examples of this ‘gentry’ status include Gananoque Town Hall—an early McDonald residence which became Town Hall in 1911, and the residence of Samuel McCammon (at 279 Kings St. W., now the Victoria Rose Inn). 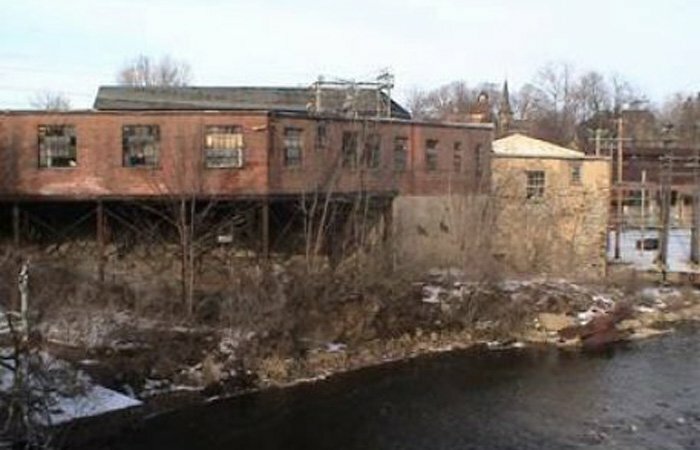 Whereas F.J.’s grandfather, Sylvester Skinner was described as “very slippery and not to be trusted without security, old man called very dishonest,” the ‘new’ merchant families which included the Skinners were already on the rise by 1868, when the McDonald’s sold their water rights on the Gananoque River that had powered the town’s mills of many enterprises. With the rights acquired by a group of manufacturers, the Gananoque Water Power Company was created to offer better regulation and allocation of water flow. F.J. was later a president of the company. The completion of the Thousand Islands Railway in 1889 (originally constructed by the Rathbuns of Deseronto as a timber line to remove the cut lumber from the watershed of the Gananoque River), further promoted Gananoque as an industrial centre, as demonstrated by the incorporation of Gananoque as a town in 1890. The first Council of the new Town had an entirely new slate of officials, and none of the old-guard families. In 1898, F.J.'s father, Sylvester, jr., incorporated the business under a provincial charter, with the name Skinner Co., Ltd. Sylvester, jr., served as president until his death in 1903, whereupon F.J. assumed the presidency. The business was clearly a lucrative operation to allow the new president to build a stylish mansion a mere two years after assuming control of the company, and to erect it in a location favoured by the town’s traditional elite. No events of note are yet known to be associated with 95 King St. W.
Frederick James Skinner (1867-1933) was the son of Sylvester Case Skinner and Josephine (née Webster), and married Bertha (née Van Heusen, 1871-1943). F.J. lived most of his life in Gananoque, entering the family business after his schooling. The family company was established 1834 in Brockville by the elder Sylvester Skinner and William McCullough, and produced harvesting goods such as scythes, snaths and grain cradles. As early as the Great London Exhibition of 1851 the firm was awarded an exhibition medal for the quality of their agricultural tools. In 1857 Sylvester, sr., bought out McCullough, relocated to Gananoque (perhaps after financial difficulties), and admitted his two eldest son’s (Amasa and Sylvester Case) into the partnership—calling the enterprise The Globe Works. The manufacture of other products such as ash wood hames, saddlery, carriage hardware, crosscut saw handles, and steel snow shovels, contributed to the growth and success of the business. The Skinner factory was located at 5 King Street East (immediately east of the former railway/current pedestrian bridge, current FIA Building). 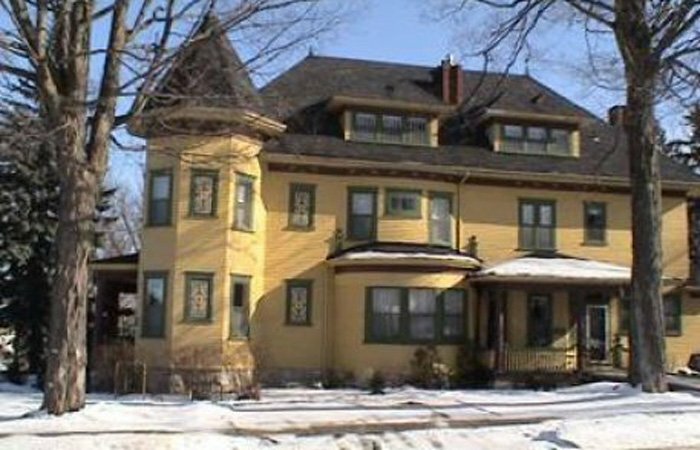 F.J. constructed his residence a short distance from his principal business enterprise—a traditional proximity in the 19th century, but a little old-fashioned for wealthy industrialists by 1905. In 1910, with the advent of the automobile, F.J. expanded the operations of the company with the manufacture of round bar bumpers. F.J.’s foresight to manufacture components for the new technology, kept the firm at the vanguard of industrial developments. As the bumper business developed after the First World War, the company became a patent licensee of such concerns as the Metal Stamping Company of Long Island; the C.G. Spring and Bumper Company of Detroit; and the American Chain Company of Bridgeport, Connecticut. These relationships resulted in the continued growth of the company, and made the firm was desirable for acquisition in 1929 by the powerful Chicago-based Houdaille-Hershey Corporation. F.J. continued as president of the Canadian operations which were relocated to Oshawa in 1930. His son Fred Skinner, jr., succeeded as third president, following F.J.’s death in 1933, and the company (renamed Houdaille Industries) prospered well into the post-war period but is no longer. F.J. was also prominent in the community as a MLA (MPP) for Leeds, twice elected as a member of the Conservative Party, and serving from 1926 until his death in 1933. His funeral was described as a noteworthy ceremony, with the Premier, George S. Henry attending. F.J. was interred as the first occupant of a stately and elegant mausoleum which occupies a commanding location in front of the entrance. Exterior: 95 Kings St. W. is a highly animated, asymmetrical composition that takes advantage of its corner lot with a multi-sided corner tower with a conical top surmounted by a finial, numerous gables which are also topped by finials, a huge variety of window shapes and glazing bars, and porches and verandahs supported with Tuscan columns and enclosed by inverted basket-handle rails that create a playful contrast of light and shade. Constructed and clad with wood, the basic clapboard exterior offers a pleasing contrast to areas of intense ornament. 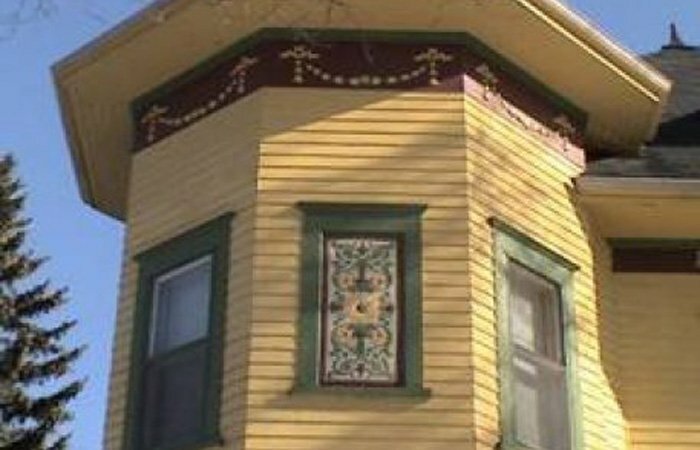 Pressed metal panels are employed in a manner that replicates more traditional wood and terra cotta detailing, such as a fascia below the eaves (decorated with low-relief garlands), while window-sized rectangular panels enrich blank walls much in the manner of stained glass (but allowing a solid wall on the interior). Additional ornament of wood includes urn-topped supports for rails, or keystone-shapes in the surrounds of l’oeil de boeuf windows—both round and oval (the oval window, which illuminates the mid-stair landing, is the most elaborate stained glass window in the building). The narrow, principal elevation faces Kings St. W., with the secondary façade arranged to create a pleasant composition for the less prominent Church Street (west) elevation. The west elevation is quite a jumble of different window openings and angles, but was not intended to have a prominent prospect. Interior: Passing through the vestibule with its exterior and interior oak and glass double doors, one is greeted by a spatially dramatic entrance hall and stair. Physically and visually the entrance area gives direct access to what was deemed the public spaces in the early 20th century—the double parlour on the right and the dining room past the stair. Appropriately, for the level of ornament and public visibility (as well as original integrity), these spaces are included for interior designation. These rooms are all richly appointed with oak (painted in parlour) for the doors, window frames, stair rail, wainscot, and built-in benches, while the ceilings are covered by decorative pressed tin (with each space having a different pattern). A dramatic entry to the entrance hall and stair is ensured by the commanding oak and bevelled glass doors set with equally elaborate hardware. This space also has some of the finest stained glass windows in the house—the richest of which being an oval pictorial composition at the mid-stair landing. For the convenience of visitors, a well appointed cloakroom was also incorporated into the stair structure (complete with stained glass window for light and privacy), located a half flight down towards the basement. The dining room continues the decorative impulse of the entrance hall, with the rich atmosphere created by oak wainscot—incised with a groove at the top to allow the convention of displaying valued plates for additional ornamental impact. Whereas dining rooms tend to be long rectangles, at 95 King St. W. the octagonal shape of the chamber is somewhat unusual, with three of the equally proportioned walls filled by windows (part of a two-storey bay on the east elevation). The play of differently shaped rooms is a theme throughout the house, with almost all rooms featuring irregular walls or ceilings. The double parlour is divided by a partial screen formed by paired Ionic columns and Ionic pilasters set on a low wall. More diminutive, tiered Ionic columns flank the elaborate mantels in each section of the parlour. Each half of the parlour is spatially distinct—that adjacent to the entrance hall has an angled visual pull towards the corner tower, while the rear portion (opposite the stair and dining room entrance) has an expansive feel from the wide ellipse of the bow window. In the 19th and early 20th centuries, parlours were typically considered a womanly domain (whether the residents treated it that way or not), and features such as the extra heat from two hearths, ample light for needle crafts, plaster walls instead of panelling, and the feminine connotations of the Ionic order, underscored the gender reference. Past these front rooms were the private family areas. On the ground floor is the semi-private study (at the time it could also be called library or office), and kitchen, pantry and servant areas (including the back/servant stair). The second floor contained the four family and additional servant bedrooms (albeit set well to the rear). The concept of the entrance and stair hall giving access to all the principal rooms on the ground floor, was replicated at the bedroom level. At the top of the stair is a large space, with ample natural light, that could be used by the family when not dressed to receive people from outside the household (and often used as an unofficial office by the female head of the household where she could be out of sight, but within earshot, of the goings on below). Originally the attic was an open space for storage and exercise space for children during inclement weather, but it was divided into apartments in the mid-20th century, with more recent alterations to suit to the operation of bed and breakfast accommodation. Architect: By the time Frank T. (Franklin Townsend) Lent (1855-1919) designed F.J. Skinner’s residence, he was already well known in Gananoque and the surrounding area as an architect, particularly for commodious suburban and country residences—a point amply conveyed in Lent’s three privately published books promoting this type of domestic architecture—in which he comments about designing and supervising the construction of over 200 suburban residences. Born in Poughkeepsie, New York, Lent gained his B.S. from Rutgers University in New Jersey in 1878, and this was followed by two years of postgraduate training in the New Jersey-based architectural firm of William A. Potter. Lent described his first 20-years of architectural practise as focussed in the vicinity of New York City and Boston, with commissions in a total of nine states. In his middle to mature years, Lent became associated with the cottage country of the Thousand Islands and Rideau Lakes area (e.g., Rockport). His first commissions in this area are of ca. 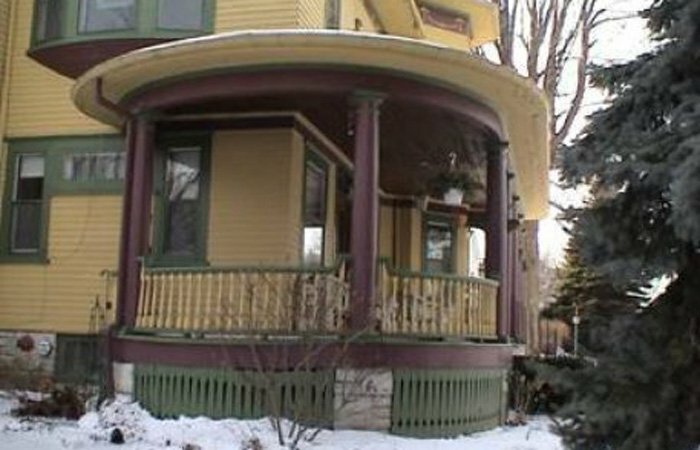 1899, and around 1900 he designed for himself a house at 120 Market Street (at the southwest corner of the intersection with Clarence). In 1901 he advertised himself to be “devoting his entire time to St. Lawrence river work as resident architect and inspector.” This geographical transition may have been prompted by his second wife, Fannie Clarke Deane, who was of Mohawk background. 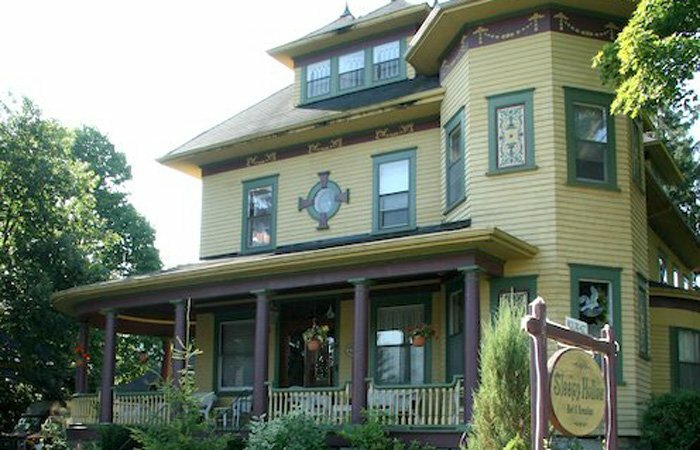 Additional notable summer and suburban residences by Lent include: Dr. E.L. Atkinson’s cottage (ca. 1900), Big White Calf Island, Admiralty Island Group, Thousand Islands; Christ Church Rectory, Gananoque (ca. 1900) just down Church Street from 95 King St. W.; Nokomis Lodge, Howe Island (1914, destroyed by fire 2003); and 18 Barrie Street (at the corner of King) Kingston which was substantially remodelled to the designs of Lent in 1905 in an imposing Classical Revival style (originally constructed in 1830, it was renovated for Queen’s University, Faculty of Medicine 2007). Institutional buildings, however, were not unrepresented in his oeuvre as demonstrated by the Gananoque Clock Tower, Stone Street (1903) and by St. Paul’s Anglican Church, Elgin, Ontario (1903-05), a towered Gothic Revival design of squat proportions but intricate interior woodwork by James Stanton. Gananoque’s Blinkbonnie Hotel is also attributed to Lent. 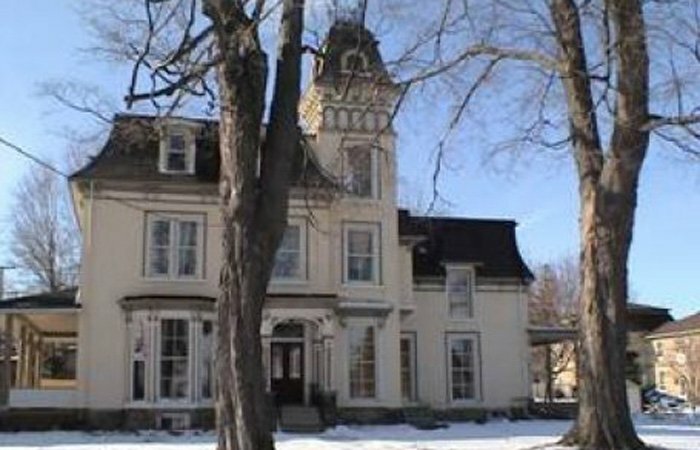 Although located close to the current centre of Gananoque, when constructed, the F.J. Skinner residence was definitely situated in a suburban environment, and accordingly is part of Lent’s preferred output of suburban and country domiciles. Lent spent his final years at his principal residence in Sterling, Massachusetts, but returned each summer to the Gananoque area to reside in this cottage “Wee Rocks” on the south side of McDonald Island. While was not of sufficient status to be included in standard architectural biographical references, Lent is undoubtedly a prominent architect for Gananoque and the Thousand Islands. Builder:F.J. Skinner utilised the builders Mitchell and Wilson to construct his residence. Like Skinner’s own firm, the owners of Mitchell and Wilson consolidated their economic and social position from the mid- to late-19th century, and were a well-established and prominent company in Gananoque in the early 20th century. The Mitchell and Wilson Company dated back to 1840 when George Mitchell opened a carriage making business that soon included joinery and house building. The youngest son, David, survived to take over the family business in 1886 and in 1892 formed a partnership with David Wilson. Wilson was a bricklayer and took over the construction component of the business while Mitchell supervised the planing mill and supply aspects of the company. The firm was clearly a leading construction firm in Gananoque at the time of the construction of the F.J. Skinner residence in 1905, as Mitchell and Wilson erected the Gananoque Clock Tower with its superlative workmanship in 1903. The Mitchell and Wilson Company maintained a prominent role in the building history of Gananoque following the construction of the Skinner residence, relocating to new premises at Market and St. Lawrence streets in 1912 (a year after Wilson died). 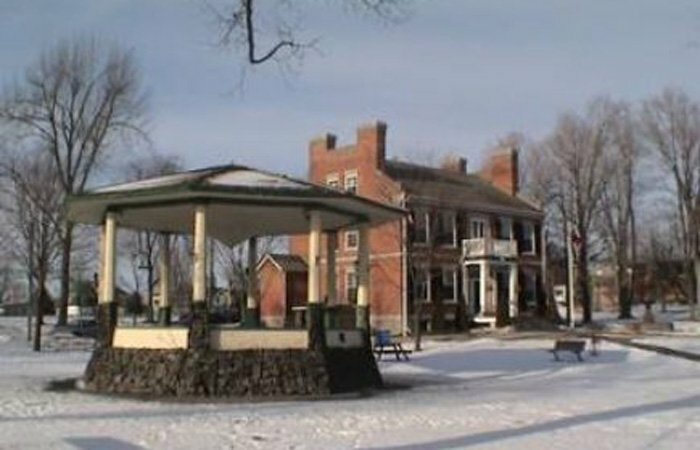 The firm is remembered for other significant structures in the area, such as: Nokomis Lodge; the Gananoque Band Stand of 1921 (designed by then Gananoque Band member William Rees; the old high school (demolished), and the gates at the three town entrances. 95 King St. W. sits proudly among other commanding residences (many of them older) and religious structures along King Street West and side streets such as Church. Neighbouring buildings include: Beaver Hall at 75 Kings St. W. (2 buildings to the east, 259 King St. W., and the Victoria Rose Inn at 279 King St. W. A short distance to the south on Church Street are a commanding Italianate Style residence, and Christ Church with its integrated rectory (designed by the same architect as 95 King St. W.). The polychromatic exterior is an adaptation of colours derived from archival and paint analysis of different periods and, fundamentally, is in keeping with the Queen Anne Revival Style, while at the same time offering a balance to the towered exuberance of its neighbours such as 279 King St. W.
The site around 95 King St. W. is consistent with its early 20th century origins as demonstrated by early images of the property. The front/north and west/side elevations are prominently visible to the streetscape, there are a select number of trees that do not obscure these façades, and the primary ground cover is a lawn. Variations over time include the arrangement of shrubbery and flower beds, but these play a secondary role to the above landscape features. While provision for parking and cars is not original, accommodation for the automobile was an early alteration, as the first owner F.J. Skinner not only had the means to purchase a vehicle, but he also produced components for them, and required regular use of the vehicle for both his work as an MLA and a car part manufacturer. Recently painted with bright colours, and situated on a corner lot along a principal municipal street that is also a traditional regional east-west highway, 95 Kings St. W. is an eye-catching structure. The building has also been prominent by virtue of its owners or the accommodation it offered. F.J. Skinner was already an influential man in Gananoque when he commissioned its design and construction. His significance increased in the next near-30 years of his life, as his business prospered by addressing new technologies, and because of his two terms as a member of the Ontario Legislature. Subsequent owners were not as prominent in business or civic affairs, but the alternate forms of accommodation offered in the structure over the years has maintained a prominence of sufficient stature for the building, such as with: early tourist accommodation, as a nursing home, notoriety stemming from an ill-fated attempt to re-zone the property for commercial use as an art gallery and, after 1999, as a bed and breakfast which since 2002 has offered a wide package of options beyond standard overnight accommodation. Donald H. Akeson, The Irish in Ontario: a study in rural history, chapter 6, “Gananoque 1849-71,” (McGill – Queen’s University Press, 1984 and 1999), p. 287, 299-304. R.G. Dun and Co., “Leeds Co., Canada West,” p. 86, in Akeson, The Irish in Ontario, “Gananoque 1849-71,” p. 287, 299-304. Akeson, The Irish in Ontario, “Gananoque 1849-71,” p. 289 and 291. Gananoque Historical Society Newsletter, Special Ed., 1990, p. 4. Sleepy Hollow Bed & Breakfast, owner’s research file, F.J. Skinner obituary, n.s., 4 November 1933; Skinner family mausoleum, Willow Bank Cemetery; Canadian Register of Commerce and Industry, ca. 1959, held in the University of Western Ontario, and Akeson, The Irish in Ontario, “Gananoque 1849-71,” p. 304. Either of two curved pieces of wood and/or metal fastened over the collar of a draught horse, used to attach the traces (each of pair of ropes, chains, or straps connecting the collar of a draught animal with the swingle-tree (cross-bar pivoted in the middle, to ends of which traces are fastened in a cart, plough, etc.) of a vehicle). Biographical information and quote from, Freeman Britton, Souvenir of Gananoque and the Thousand Islands, privately published by the publisher of the Gananoque Reporter, quoted in Ah, Wilderness! p. 96. Commissioned by Charles McDonald of Gananoque, the tower was part of the Fire House complex with the portion below the clock level serving as the hose drying chamber—the chimes could also ring to a code that indicated what area of town a fire or emergency had been noted. See, Gananoque Historical Society Newsletter, no. 4, Feb. 1986, p. 39; and Gananoque Clock Tower, heritage plaque. E.g., Avery Obituary Index of Architects and Artists (Boston). Gananoque Historical Society Newsletter, no. 4, Feb. 1986, p. 39. Gananoque Band Stand, heritage plaque.